I promised that I would discuss equipment we are using for recording our narrator’s voice, and this is the correct time to do that. After completion of the audio version of Geminknot, we have learned a few things that I want to pass along. First of all, the size and design of the sound booth is perfect for our needs. It is both pleasant, attractive as well as functional. As I’ve said previously, you must consider how much time your narrator will spend in a small enclosure and how important it is to provide an environment conducive to good work. We are using a professional microphone by Shure (model # SM7B) which is widely respected and for good reason. We have found that it will pick up vocal sounds in a way that enriches a voice but will also faithfully pick up unwanted sounds, the kind you will hear during the editing process. I want to give you a heads-up regarding several of them. We earlier identified chair squeaks during body motion and by experimentation find that most of the time we can’t do anything about it. Our solution has been for the narrator to move in the chair as little as possible during active sessions. Another interesting sound occurs during touchpad use on the Apple laptop, either during ending the recording session or during pauses. Even though this sound might be missed by the intended audience, we choose to edit them out. Speaking of the computer, we have discovered that during a long session, the computer’s ventilation fan is activated and can easily be heard in the recording. Solution: place the computer on a cool object (we use gel-based cold packs). Unfortunately, various human sounds, those that originate within the digestive system, are part of the listening experience and are exceptionally hard to eliminate short of starting over. A word about our equipment, but I want to emphasize that many other systems will work as well as ours and that we make no claim to have a superior system. I have already mentioned the mike, and you can see the wrap around sound absorber behind it. An interface is required to input the recording into our computer (which is visible on the right side). We are using a Track 16, which we also use for music session recordings. It is a very high quality unit and easy to use. Our narrator wears a pair of Shure headphones during the recording (SRH 840) which enables her to use playback to edit or continue the session. The computer is running Logic Pro X which inputs and records the session. The file is stored on our iCloud and is therefore protected from loss and easily retrieved later for editing and conversion to an MP3. 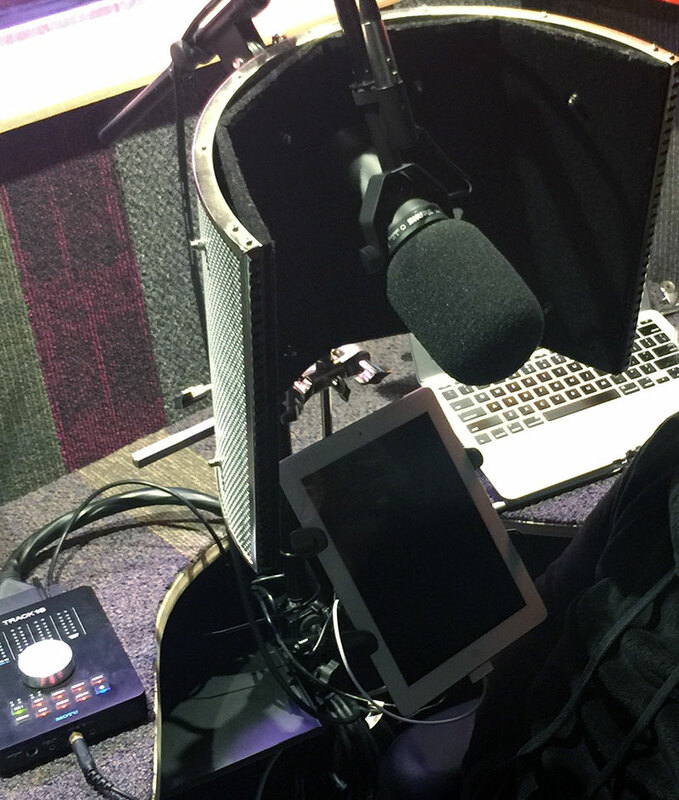 To insure that there is no paper rattling, we use an Apple iPad to display the text for narration. The results speak for themselves, and our sample recordings will soon be updated with the latest version. Currently we are creating music to be overlaid and blended with the narration. Next time, I will disclose our settings and filters for Logic Pro which have allowed us to modulate and improve what was already an excellent recording.